An original, modern place with classic color combinations and an irresistible atmosphere. In Creta café, in the center of Matala, you can enjoy your coffee, your drink or the meal of your choice. Cool ice creams in unique flavors for little or grown-up kids and delicious juices from fresh fruit. Every Monday and Friday you can enjoy your meal or drink along with live music by traditional and foreign bands. 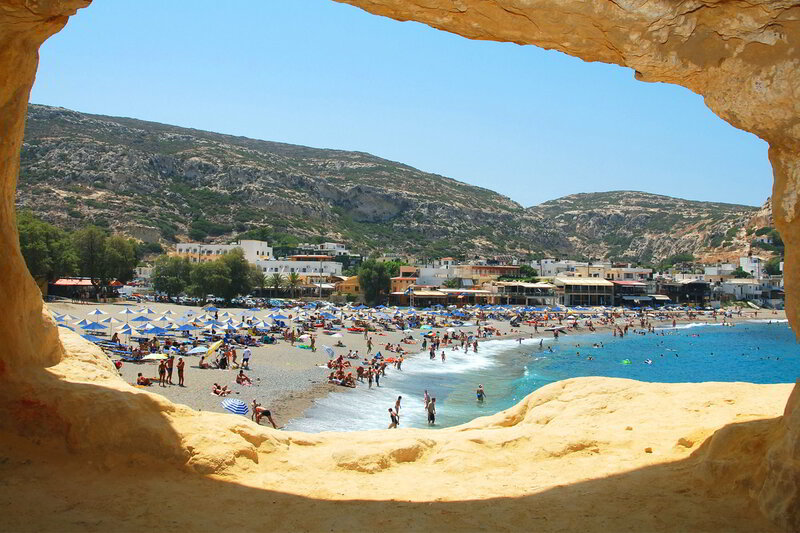 Matala has something for everyone. Although it has become a popular tourist destination it still retains the charm and character of the quiet fishing village it started as at the beginning of the 20th-century, and the laid-back lifestyle of the hippies of the 60's and 70's lives on. 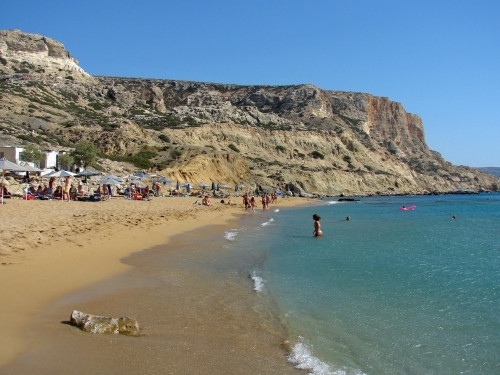 Half the beach is fringed by tamarisk trees, leading the eye on to impressive formations of sandstone rock cliffs with their famous caves sliding into the sea at an odd angle, creating one of the most unusual beachscapes on the island. A masseuse sets up a tent on the beach, and cafes and tavernas have terraces overlooking the beach and out to sea ... after a day on the beach or exploring the village you can sit and watch the sunset over the Libyan Sea, looking out over the islands towards Africa. 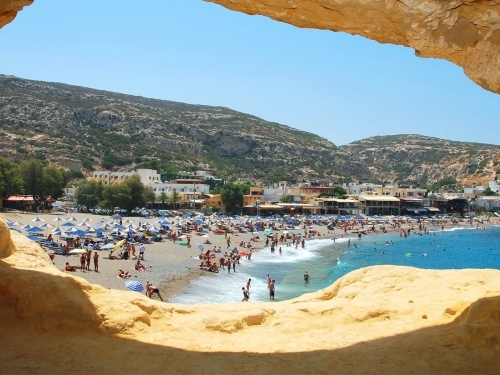 Matala it is one of just over 400 beaches in Greece that have been awarded a Blue Flag. This exclusive eco-label is given to beaches that offer cleanliness and safe bathing areas and has strict criteria dealing with water quality, environmental management and safety. There is a lifeguard and first aid facilities, as well as toilets and a shower. 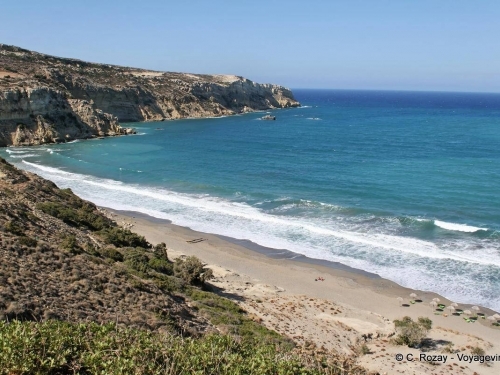 Near the beach are opportunities for learning about environmental projects, such as with Archelon, the Sea Turtle Protection Society of Greece, and the beaches of Matala, Kommos and Red Beach come under Natura 2000, a European Union network of nature protection areas established to assure the long-term survival of Europe's most valuable and threatened species and habitats. At the beach there are sport facilities as well as activities for children, and if you would like to go further afield you can also rent a car, bicycles and motorbikes. Yet all this is only 75 km from Iraklion.